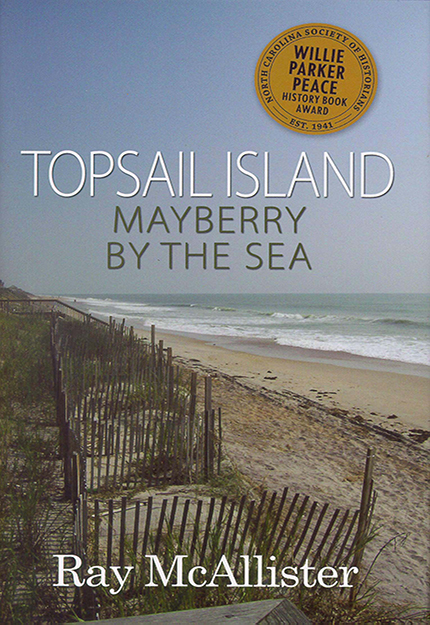 Topsail Island: Mayberry by the Sea, $19.95 hardcover. ISBN 978-0-89587-331-6. Pub. 2006. 5-3/8 by 8-1/4 inches, 228 pages, 40 B&W photographs, maps, drawings. Topsail Island is a North Carolina barrier island lying between the Outer Banks and Wilmington. Though 26 miles long, it is but 200 yard wide in places and encompasses only 15 square miles. Residents and visitors call it a stretch of paradise. Topsail remains largely in the idyllic state other islands knew half a century ago — a small beach town with few commercial trappings, a family haven whose devotees return generation after generation, a paradise where it’s possible to rise over the Atlantic Ocean and set over Topsail Sound from the same cottage. But Topsail’s outward simplicity belies its rich history and complex future. The island’s name. It have been born the pirate Blackbeard hid his ship behind the island, lying wait. Those strange block-like towers spaced along the beach. Remnants of a top-secret missile program. The modest old-time cottages with the whimsical nameplates? They’ve survived some of the worst storms Mother Nature has devised, only to see their owners tempted by developers offering big money for the land on which they sit. Then there are the giant sea turtles, the Gold Hole, and even a traveling bear. In Topsail Island: Mayberry by the Sea, author Ray McAllister tells the many stories of Topsail with the help of those who know the island best. “Fascinating stories and tales [in[ a beautiful book.” Named Book of the Month. –WAAV-AM NEWS TALK RADIO, WILMINGTON, N.C.